Spring is just around the corner, and we’re already dreaming of the good moods and good views on the horizon here in our western North Carolina haven. Gardening. Grace Ridge is a gardener’s paradise. Resident green thumbs love growing vegetables and flowers in our raised beds and are eager to start planting this spring, including love birds George and Ruth Smith! Walking. The Catawba River Greenway is practically in our backyard! With four miles of majestic views, the greenway is great for quick jaunts or long walks. But that’s just the beginning. Morganton is known as the “Trailhead of Western NC” for a reason, so bring your walking shoes! Day Trips. We enjoy outings year-round, but spring is one of our favorite times to get out and explore. 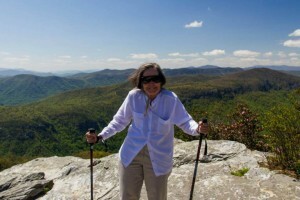 Our outings connect residents to the best of the Blue Ridge. Some popular jaunts have included boating on Lake James, hiking Table Rock Mountain and visiting the Downton Abbey exhibit at the Biltmore Estate. Playing Golf. Grace Ridge residents receive complimentary membership at nearby Mimosa Hills Golf & Country Club, so a round of golf with friends is a favorite activity, especially in spring when the weather is perfect and the trees are in bloom. March 19: Friends of the Library Author’s Luncheon, featuring Jay Leutze, author of Stand Up That Mountain, the true story of Avery County’s battle to save a mountain on the Appalachian Trail. Call us at 828-580-8300 for details! March 25: Lift your spirits with an afternoon of soaring sounds as we welcome the Western Piedmont Symphony’s Kaia String Quartet. Internationally recognized, the Kaia Quartet is known for their passion and energy. Click here for more information. April 14: Reduce stress and boost your mood with Healthy Minds, a special presentation by Dr. Chasse Bailey-Dorton, Co-Medical Director of Survivorship & Integrative Oncology at Carolinas HealthCare System. Click here for more information. If you’re interested in joining us for an activity or event, or if you’d like to plan a visit to Grace Ridge Retirement Community, simply call us at 828-580-8300 or email info@graceridge.org.